Summary: Anda loves Coarsegold Online, the massively-multiplayer role playing game that she spends most of her free time on. It’s a place where she can be a leader, a fighter, a hero. It’s a place where she can meet people from all over the world, and make friends. Gaming is, for Anda, entirely a good thing. Review: Not gonna lie… I picked up this book because of the awesome art and it did not disappoint. The colorful art is beautiful and well-drawn and five kinds of amazing. The actual story, on the other hand, did disappoint. 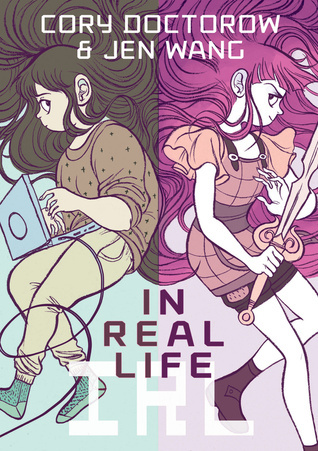 The first half of In Real Life sets up an interesting story about Anda, who gets into playing Coarsegold Online and then befriends a Chinese teen who gold farms for a living. Issues such as feminism, poverty, and worker exploitation are brought up… and then later tossed aside. In the second half of In Real Life, the story pacing goes haywire, speeds up rapidly, and ties up the entire conflict in a way that smelled really, really strongly of the white savior trope. Little time is given to the perspective of the Chinese gamers that are so central to the plot. It was disappointing to see the story take such a problematic turn. The art is stellar, and the graphic novel does present some interesting food for thought on feminism, economy, gaming and exploitation… but the problematic resolution was ultimately off-putting. Dammit! I was so looking forward to this, I thought Cory Doctorow would do better than this. Thanks for the warning, love your blog.